The cold seems to have left for good – Floridians (and transplants) rejoice! Spring is the ideal time to enjoy outdoor activities before the hot summer temperatures arrive in a few months. Many of our local gardens and parks host monthly outdoor movies, and the majority are either free or under $10. Use this opportunity to not only catch a movie you’ve been meaning to see, but to also explore one of our many picture-perfect gardens, parks, or even take a short road-trip to nearby Ocoee or Lakeland for a budget-friendly movie date. Here’s where to catch free outdoor movies in Orlando this March through May. A favorite for date night, Leu Gardens screens an outdoor movie the first Friday of most months. One of the best things about this movie screening event is that outside food, beer, and wine are permitted. Pack a picnic basket with goodies from nearby East End Market, or get your fill from the onsite vendors and food trucks. The gardens open at 6pm, so arrive early to snag a good street parking spot (only Leu members are allowed to park inside the gardens) and do a bit of exploring before the show. The food truck for all three spring events is Curbie’s Sidewalk Cafe, and Peak Season Pops will be onsite selling their delicious popsicles and popcorn to munch on while enjoying the movie. Have you ever watched a movie at a golf course? Movie in the Pines allows attendees to watch a big-screen movie outdoor on the range. There will also be food trucks in case you get hungry, and if you’re a traditional moviegoer, enjoy all you can eat popcorn. This event occurs monthly on select Thursdays. Family Movie Night takes place Sunday evenings at Old Town in Kissimmee. Family-friendly movies range from classics to newer releases. Bring along a chair and grab some snacks nearby for maximum enjoyment. Movies are screened in the South Entertainment Area. While movies don’t begin until around 7pm, arrive early around 5pm to partake in fun giant games set up for the whole family to play. Held outdoors on the soccer field at Maitland Middle School, Screen on the Green is a semi-monthly family-friendly movie series. Food is available for purchase, and you’re welcome to bring along chairs and blankets. All movies are free, and so is the popcorn! Enjoy this monthly family-friendly activity featuring food trucks starting at 6pm, with the outdoor movie starting at 8:30pm. Upcoming dates are Friday, March 16, Friday, April 20, and Friday, May 18; movie selection TBD. Movies are free. 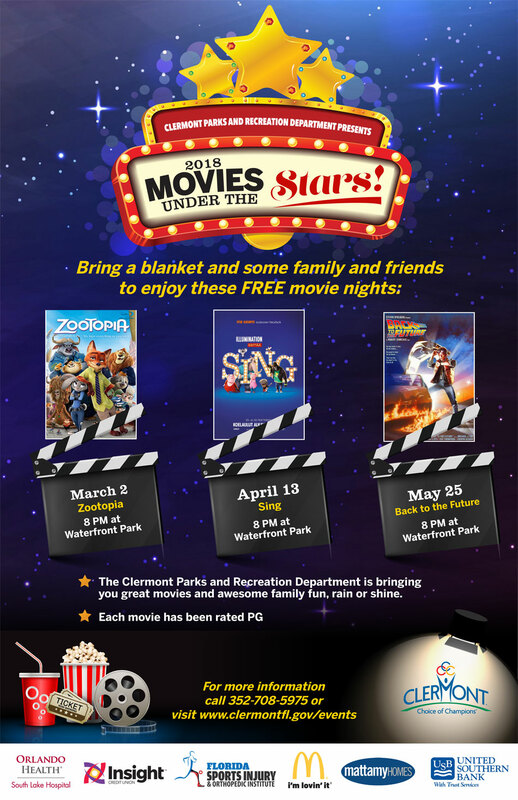 Take a drive over to Clermont and catch a free movie at Waterfront Park. Upcoming movies include: Zootopia (March 2, 8pm), Sing (April 13, 8pm), and Back to the Future (May 25, 8pm). All three movies are free.